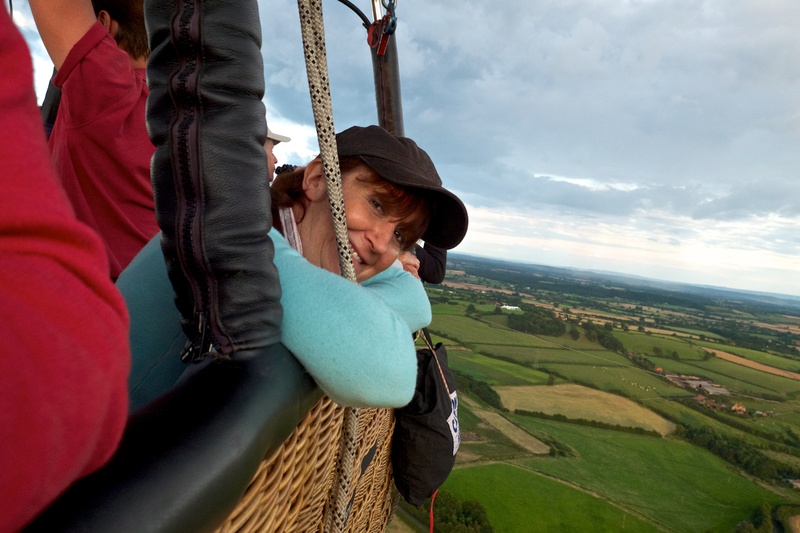 It has long been a wish of Mrs P to go for a balloon ride and it had been put off for far too long. Well we don’t put things off any more so it was booked and paid for when we came back from holiday. The first attempt was cancelled due to bad weather, which is not an unusual occurrence for these things. What was unusual was that our second attempt was successful, as some of our fellow travellers in the balloon had waited two years and 12 attempts to get lucky! 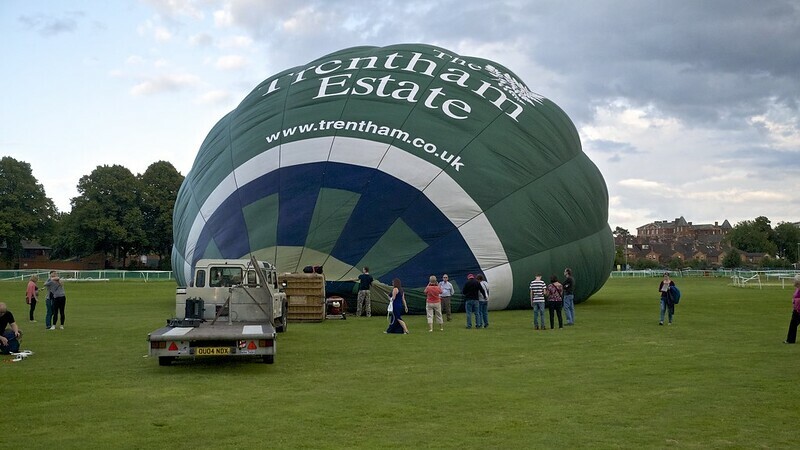 So 6.30 saw us at Pitchcroft Racecourse in Worcester where the balloon was laid out ready. Although the evening had been glorious, when we arrived there were some dark clouds hovering around and our pilot wanted to wait for them to clear if possible. So we had a natter to a chap with a helicopter drone with a GoPro attached, who was playing with his toy and hoping to get some good footage of the balloon taking off. It was absolutely fascinating and the gimbal attaching the camera to the helicopter gave perfect control and stability for the camera. A very tempting new hobby but then I began to think about how much I would actually fly it and decided that another Fuji camera might be a better way to spend money I haven’t got! Eventually we had to set off or it would have been too dark to fly, so we were told what would happen and instructed on how and when to get in the basket, which is not as easy as you might think. Then the balloon was inflated with cold air to fill it up and once it was fairly full the burner was turned on. The balloon then filled more and rose whilst the basket stood up, we all had to clamber in our places in the basket and then we were off! It was not a bit scary and for Mrs P the basket was nearly up to her chin, so we felt very safe in its confines. We slowly rose off the racecourse and drifted across the houses and streets, it was not windy or cold, just gentle and magical and as we flew over the rooftops we waved to people below as the dogs barked madly along our route, spooked by the noise of the burner. We took some pre-packed glasses of wine that we had bought in France to toast our voyage, as you can see above. We flew over fields of sheep and on towards Droitwich where we dropped very low over the houses and could talk to the folk below. One thing I was not expecting was the excitement and joy that the low flying balloon caused. It was a very special feeling to be the cause of so much excitement and joy. Children chased us, waving and cheering, people in their cars stopped and took pictures through their sunroofs, we even shouted down to a couple in their hot tub, telling them to get ready as I threatened to dive in! In fact everyone seemed very pleased to see us and it made us feel like Mary Poppins. We flew on and our pilot soon began to plan his descent. They try not to land in a field of crops as it tends to annoy the farmer, as does landing amongst animals. In our case he managed to find a hay field newly cut which was perfect and to seal the deal they carry a bottle of whisky for the farmer. The Landrovers followed our journey and caught up with us once we had landed. Then the balloon had to be packed up and loaded onto the trailer, which was a job that involved everyone as by now it was getting dark. Once done we all piled into the Landrovers and were taken back to the Racecourse. It was a truly magical evening, every bit as perfect as Mrs P had imagined it would be and for me something that I might never have done without her wish to do so. It was a wonderful evening and as I watched Mrs P bound over the rows of hay in the field where we landed I felt immensely happy that we had made this dream of hers come true. Anyway click on the photo below to see more pictures from the adventure. Click on The Image Below to see a Slideshow of all the photos from the day. Categories: Blog A Pic, Fuji, Photo Blog | Tags: Balloon ride | Permalink. It was Simon, if you get the chance do it! We were the Couple in the Hot Tub, we were amazed (slightly bemused) to see you heading towards us and getting bigger and bigger…….we did fear for you as we thought you were landing in a residential area……great to read of your experience. Hi John and Jackie. Aw that was great fun and the ride over Droitwich really topped it off. No danger but I really felt like we could have dived straight into your tub! Made by day you stopping by to say hello!